Late last year I was introduced to an organization called USKA. Founded by lifelong martial artist Irv Althouse, his promotion hosts both amateur and professional kickboxing and Muay Thai bouts. If I didn’t love the action that Althouse and matchmaker Jen Heffentrager deliver to the fans each and every show, I would still be equally entertained by the quality of production they put forth with little to no media coverage or recognition. Still, through it all, the non-stop stand up violence which is the “Art of Eight Limbs,” one thing sticks out more than the blood, the sweat, and the tears. At each and every show I have attended since my introduction to USKA, Althouse and Heffentrager have made every effort to give back to the community in some shape or form. They find a cause and they rally the audience behind them to generate a few dollars to the charity or person in need. At the most recent USKA Fight Night, a 50/50 raffle was conducted for a local wounded warrior, Cpl. 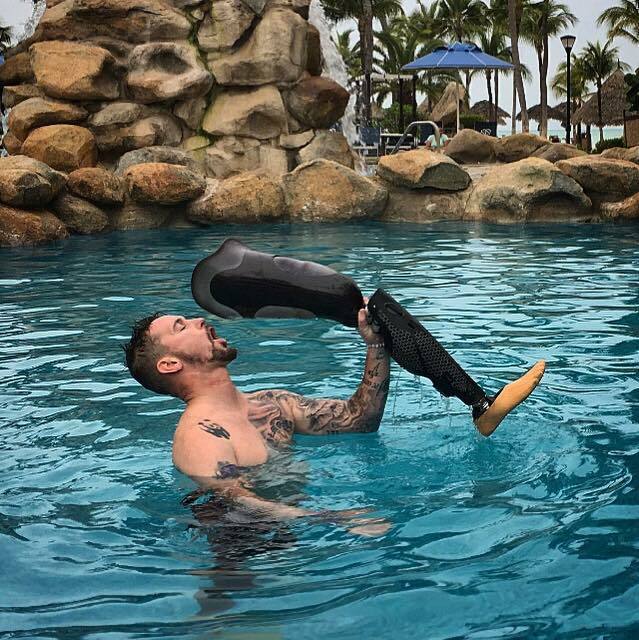 Kevin McCloskey, an Army Veteran, who lost both of his legs while serving with the 506th Infantry Regiment (4th Brigade), 101st Airborne Division in Afghanistan. After four months in country, on June 8, 2008, McCloskey was driving in a convoy of Humvees when he spotted the improvised explosive device and tried to swerve. The driver’s-side front wheel took the brunt of the blast. The others Soldiers in the vehicle walked away, one with a broken leg. McCloskey’s right wrist and pelvis were shattered. His legs were gone — the right above the knee, the left below it. Despite his injuries and having to adapt to the use of prosthetic legs, McCloskey has a great sense of humor and personality about him. After more than a dozen surgeries and months in the hospital McCloskey was medically discharged and now lives in southern Pennsylvania with his wife. He was invited to the USKA Fight Night where he sat ringside. The proceeds from the raffle were collected to help the hero with costs associated with a move into a home that was built specifically for him by Homes for Our Troops. Days after the event Althouse shot me a message, “call me”. Not sure what it was about I gave him a buzz and I could hear the sound of shock and disbelief in his voice. Not in a bad way, more of good. 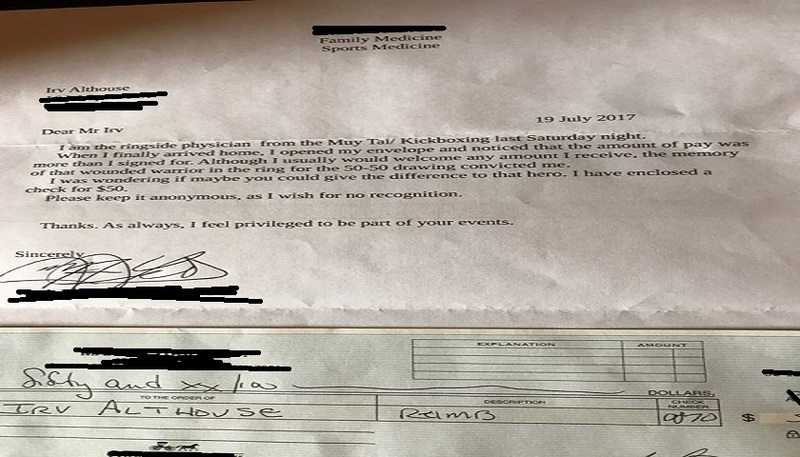 Per his wishes we kept the letter and donor’s name anonymous. The story really isn’t about the amount of money contributed. $1 would have been equally acceptable. If you could have heard the pure appreciation in the voice of Althouse you would understand that he and his colleagues do not promote for the sake of profit. Sure they look to make a dollar or two as does everyone, but if you actually get to a USKA show, there are no sponsors, there are no vendors, there are only great people. One of the fighters on the card, Mark Krumrine Jr., collected money on his own from shirts he was selling before his fight, to help contribute to fishing trips for wounded warriors. These are the types of people involved with USKA. Top to bottom, one of the best promotions I have ever had the privilege of working with. 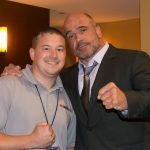 Visit USKAFights.com for info on the upcoming August 19 fight card in Philadelphia.